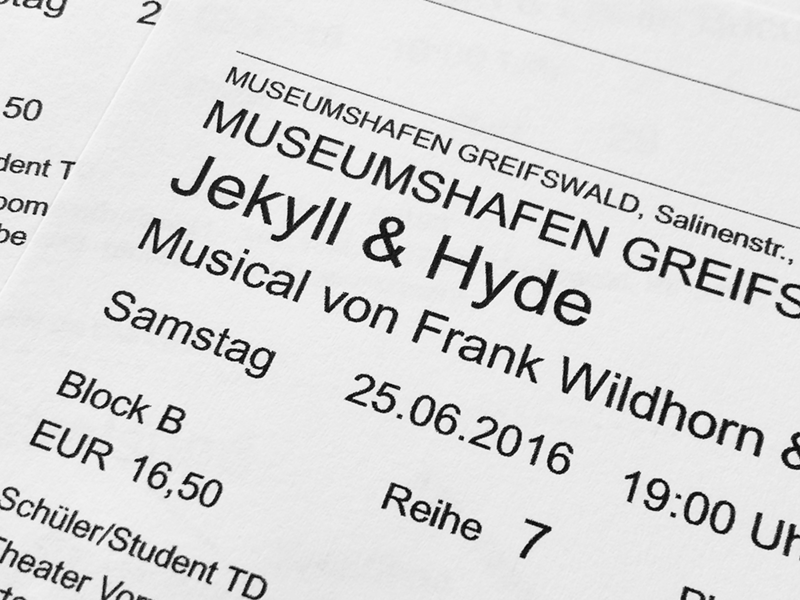 Last April, I, Ida and Rami bought tickets to see Theater Vorpommern's outdoor production of the musical Jekyll & Hyde. All three of us are big fans of the musical and also of the actor Chris Murray, who plays the titular roles in the production. So it didn't matter to us one bit that the show was staged in Greifswald, a small city in a faraway part of Northern Germany. Being as attached to the musical as we are, having seen video of Mr. Murray performing the role of Jekyll/Hyde, and then me and Ida seeing him live in Theater Pforzheim's Dracula, we knew the performance would be well worth the trouble. 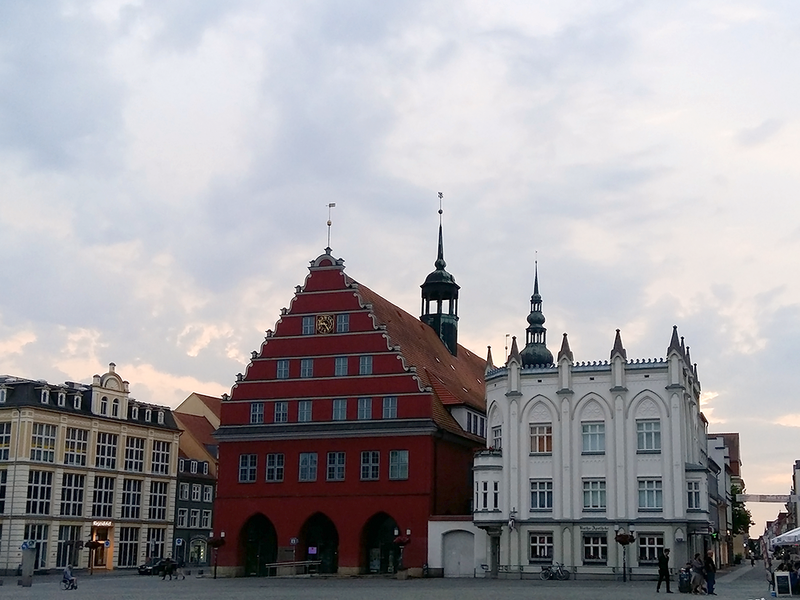 This is the story of our trip to Greifswald last weekend. Our flight to Berlin left Helsinki Airport early on Saturday morning. At 9 a.m., we were already enjoying a lovely breakfast on Berlin's Alexanderplatz, waiting for our bus to Greifswald to arrive. We had booked our journey from a bus company called FlixBus MeinFernbus. We had heard they were prone to delays – but it's cheap and we have time to spare, so how bad can it be! We're talking of a three-hour drive and the bus is scheduled to depart at 10 a.m., while the musical begins at 7 p.m.. It's no problem if there's a little delay. In the morning, we received a message informing us that our bus would be 40 minutes late. It's all good, we thought. We will still make it to Greifswald nice and early. Our bus left Berlin's Alexanderplatz a full hour late, after additional 20 minutes of confusion over booked tickets. It was a very hot day, with the temperature hitting 30 °C in the morning already. Due to the heat, a driveway out of Berlin had melted (!) so badly that we had to take a smaller road out of the city. We spent an hour in a traffic jam, found out we were actually making a detour to empty the bus' overflowing toilet (!!! !!!! !! 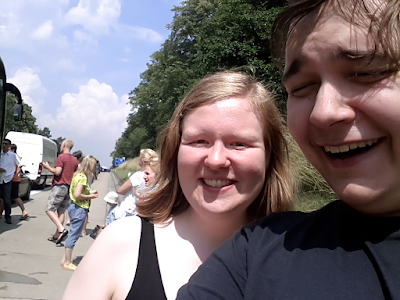 ), then started our way towards Greifswald in earnest. After driving on the autobahn for a while, we came across a complete stop. An accident had blocked the road. By this point, I started to feel really worried we would miss Jekyll & Hyde simply because we will not get there in time. We had made it to Greifswald, so everything was going to be okay now. Or so we hoped, but nature had something in store for us: a thunderstorm before the performance. We had been keeping a close eye on weather forecasts and knew a storm was on the charts. Luckily the forecasts also promised us the storm would be over before showtime. We found our pension, left our bags in our rooms and walked to the city centre – in pouring rain. We ate at a small kebab place, wishing for the storm to pass. And, just as the forecast had told us, the sky indeed started clearing around 6 p.m..
After finishing our meal, we walked to the outdoor stage. It had been a rather bad day so far, but now, we were in for a lovely night of theatre, for something that would make us forget all the trouble. Approaching the stage, a lady standing in front of the box office caught our attention, telling us something in German. "Is the show still on? ", Rami asked her. Just like that, it turned out we had traveled 1,300+ kilometers for a musical we would never see. Our tickets were refunded, but I don't feel Theater Vorpommern's outdoor box office personnel treated us with the respect we (or any customer who has to face such a huge disappointment) would have deserved. The stormy weather is of course no one's fault. But – even after hearing that we had travelled from Finland just for the show – the staff offered neither a word of explanation or any expression of compassion. A simple Is there anything we can do to help you? or We feel very sorry for you or maybe You can go drink a cup of coffee at the theater café; it's on us would have done wonders. No. Instead, they had the nerve of asking us for money when we asked if we could at least take some souvenir programmes with us. That is no way to face someone who has travelled from another country for a cancelled performance. The weather was completely fine by 7 p.m. and stayed fine until midnight. Due to storm damage and a computer error, both our train back to Berlin and our flight back to Finland were late. In total, 15% of the duration of our two-day trip was spent sitting on various stations and vehicles being late. There were two things that, in the end, made our trip worthwhile. After the terrible day we had just had, receiving a gift like that brought tears to our eyes. Good tears. Everything felt so much... less horrible, all of a sudden. Chris – once more, thank you. You're a superstar, on and off the stage. I want to let you know that on our flight home, we raised our glasses of airline coke and coffee and drank your toast at some 10,000 meters of altitude. At that moment, it was literally the highest honor we could come up with. The second lifesaver of the trip is the musical Tanz der Vampire, currently running in Berlin's Theater des Westens. I will write more about the German vampires later (edited to add: read my thoughts here). Now, I just want to say that I'm beyond grateful Tanz happened to be running in Berlin just now. As always with Stage Entertainment's productions, the tickets were super pricey (70 € for a stalls seat in row 24), but this time, the experience was worth every cent. I don't think any other musical would have helped me to forget my disappointment better than this one. 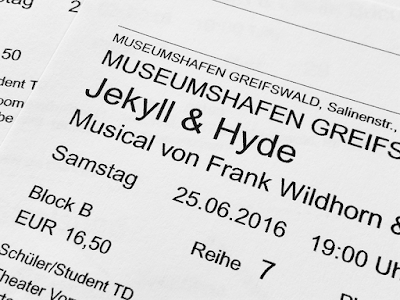 And that is the story of our Midsummer trip to see Jekyll & Hyde in Greifswald. 1 FlixBus MeinFernbus: avoid this company like the goddamn plague. The personnel's flippant attitude with no apologies about the delays whatsoever is reason enough. A wholly, thoroughly unpleasant ride, every delayed minute of it. 2 Pension Possehl: recommended with caution. The prices are rather affordable. The twin room upstairs was lovely, with a big balcony and good facilities. On the other hand, the single room in the basement was damp, moist and overall nasty, with a toilet that couldn't handle paper being flushed. Remember to bring your own soap and shampoo. Pay extremely close attention to how to unlock the front door. 3 My tirade about Theater Vorpommern's personnel only extends to the people who worked in the outdoor stage's box office. 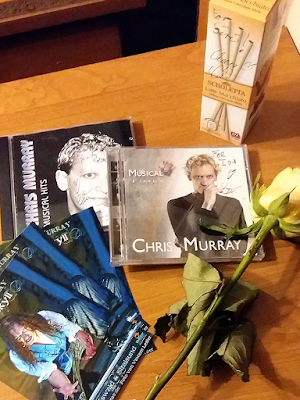 The gentleman guarding the theatre's stage door was nice and helpful when delivering Mr. Murray's gift to us. Huhheijaa mikä reissu, hatunnosto teille että olette vielä järjissänne. Kontrollifriikki minä olisi ehkä sulanut sinne autobahnille. Suuri hatunnosto myös herra Murraylle, that's the way to go. I'm so, so sorry about what happened. I've had my share of travel horrors, and I know how terrible they are. 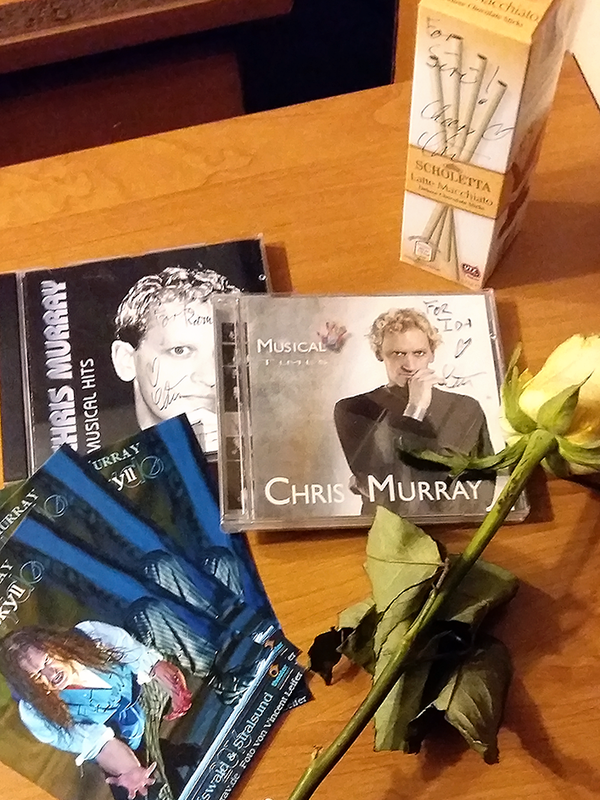 But I must say that story about Chris Murray warms my heart. What a total sweetheart. I hope this doesn't put you off traveling in the future. Thanks for your sympathy, both of you! Olipa trippi... Toipukaa. Näitä välillä tulee kohdalle meille hartaille harrastajille. Love Mr. Murray. Kyllä tämä tästä, kiitos. Kun matkaa vuosittain kymmeniin esityksiin meillä ja muualla, pakkohan peruutustilanteen oli joskus osua kohdalle. Ja kertoohan sen jo perustason pessimismikin, että se ei sitten tapahdu Tampereella. No huh, kyllä teitä koiteltiin. Mutta onneksi on tuommoisia ihmisiä kuin Chris Murray. Jep. Iltamme tähti joka tapauksessa, oli esitystä tai ei!